8th International Bangkok Bike. 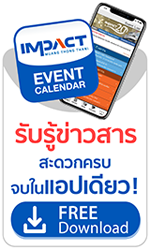 The mega cycling event is schedule for October 6-9, 216 at Exhibition Hall 3-4 IMPACT Muang Thong Thani. With its heart set on boosting the year-end cycling business, the exhibition areas has undergone an expansion covering 10,000 square metres, making this cycling event the biggest of its kind in ASEAN.